“The flavor is in the meat; the sauce is on the side,” says the sign outside JB’s Smokeshack. This is the way of the barbecue in South Carolina. We got a recommendation for JB’s from our Airbnb host Dan (thanks Dan!). It was left off their official restaurant recommendations for guests as it’s a little bit local, a little bit scruffy, so exactly the sort of barbecue shack we were looking for! JB’s is literally a shack. The sort of place you would (foolishly) drive past without a second glance. The smoking action takes place out back and as soon as we got out of the car the air smelt divine. 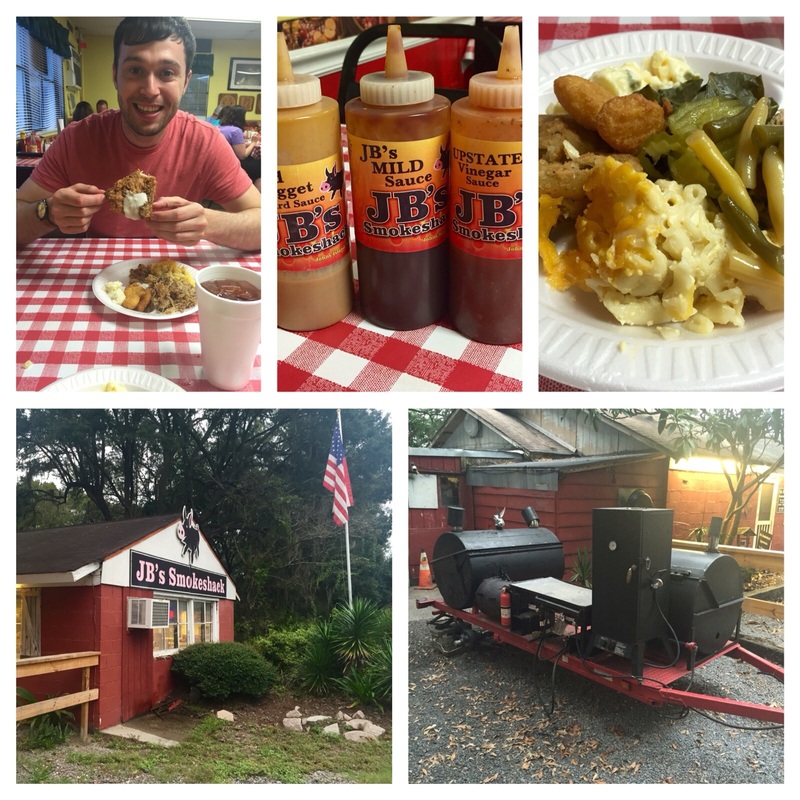 Every Wednesday – Saturday, JB’s puts on its BBQ buffet: eat as much as you like, including dessert and bottomless iced tea (welcome to the South y’all!) for only $13.50. We loaded up out plates with a little help from a seasoned JB local, as we weren’t quite sure what everything was. Pulled pork, smoked meatloaf, mac’n’cheese, collard greens, corn fritters (amazing! ), fried chicken, grits, gravy, creamed potato, pickles, and JB’s homemade BBQ sauces – on the side. No ribs, though. And definitely no onion rings or fries to be seen here. Fine dining this ain’t, so you’ve got to be prepared to roll up your sleeves, use the kitchen roll provided, and get stuck in! We left JB’s after big chats with the staff, lots of waves good bye, and a very apt introduction to the South and its great traditions of BBQ food and famous hospitality.